In our latest Huffington Post, we discuss two recent billboard campaigns promoting some very different beverages—and with very different messages about our health. One, placed above a water fountain at the Seattle-Tacoma airport, aims to discourage travelers from drinking water, directing them instead to nearby coffee shops for a whipped cream-topped drink crammed with calories. 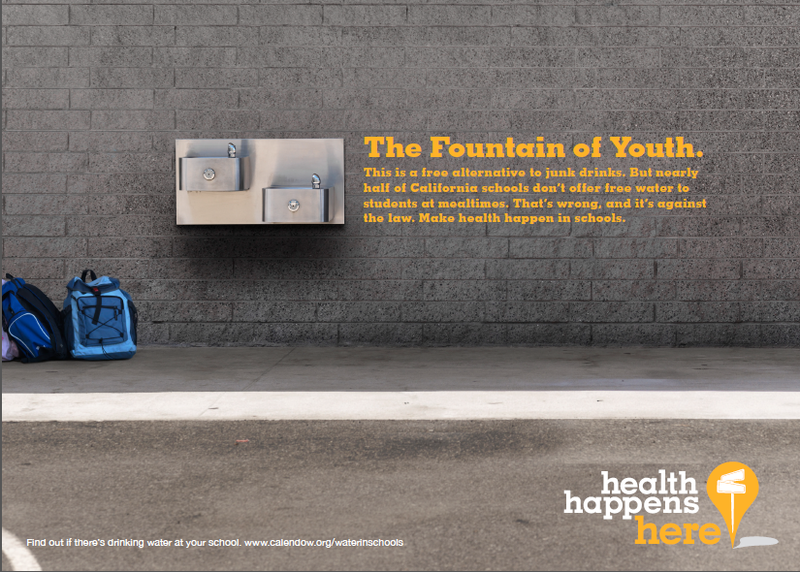 The other, created by the California Endowment, hangs in the Sacramento airport and is part of the “Health Happens Here” campaign to ensure that schools provide students with access to drinking water at mealtimes, so they have something to drink besides sodas and other sugary beverages. These campaigns highlight two conflicting paths for our country’s health and future. Increasing access to healthy foods and drinks is a key way to prevent a wide range of health problems, before they develop. And, there’s a growing realization that sugar-laced drinks contribute a large percentage of the fat and calories consumed every day by millions of people—especially children. In contrast, the food industry profits from products that provide little or no nutritional value, adding to our country’s expanding prevalence of chronic disease and pushing up healthcare costs. As Larry said in the piece, soda and beverage marketers never seem to rest in searching for ways to “drive more ounces into more bodies more often,” all in pursuit of what former Coca-Cola marketing executive Todd Putnam said was the company’s ultimate goal: “share of stomach.” Read the full article now. - New York City’s Board of Health recently approved a first-of-its-kind regulation prohibiting the sale of sodas and other sugary drinks over 16 ounces in restaurants, street carts and movie theaters – and the Brooklyn Nets announced its new arena will be voluntary complying with the measure. We hope all sports teams will do the same. - Last week, several Senators called on U.S. Surgeon General Regina Benjamin to investigate the links between sugar sweetened beverages and health outcomes. Read more. Our 3-minute video reveals the deceptive lengths that the food industry will go to in order to promote unhealthy foods to kids--from packaging that misleads parents, to ads that target kids, to behind-the-scenes lobbying to thwart any oversight. Watch now.